Charles Aznavour – French-Armenian singer, lyricist, and diplomat. A French and Armenian singer-songwriter, and is one of France’s most popular performers, Charles Aznavour was born on 22 May 1924, at the clinic Tarnier at 89, rue d’Assas in Saint-Germain-des-Prés, 6th arrondissement of Paris, into a family of artists living on rue Monsieur-le-Prince. Aznavour was known for his distinctive tenor voice: clear and ringing in its upper reaches, with gravelly and profound low notes. In a composer/singer/songwriter career spanning over 70 years, he recorded more than 1,200 songs interpreted in nine languages. Moreover, he wrote or co-wrote more than 1,000 songs for himself and others. Fondly dubbed France’s ‘Frank Sinatra’, he is famous for his unique tenor voice that is as clear in its upper reaches as it is profound in its low notes. A prolific singer with a career spanning over several decades, he has generations of music lovers enthralled with his melodious voice and winsome demeanor. 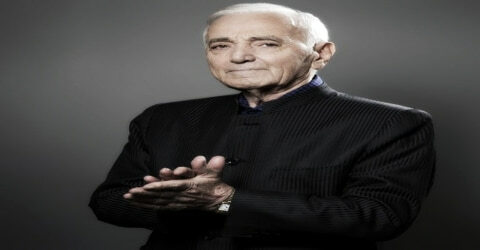 Aznavour is a multi-faceted personality who has written over 1,200 songs and performed in eight languages. Along with being a singer-songwriter, he has also tried his hands at acting and diplomatic activities. Born in Paris to Armenian immigrants, he was exposed to music at an early age by his musically inclined parents. He first performed on the stage when he was just three years old and realized early on that his calling was to be a performer. A talented young boy, he could sing as well as dance. He also attended drama classes and then quit school to pursue his passion. He struggled a bit during his initial years but soon established himself as a popular singer-songwriter. His unique voice combined with his knowledge of several languages ensured that he achieved cult status within years. Alongside his illustrious singing career, he also pursued a career as an actor, appearing in over 60 films. In the early ’50s, Aznavour often opened for Edith Piaf, and composed several songs for her, thus beginning a solid reputation as both a gifted writer and a unique song stylist. He had a special talent for writing and singing from unusual points of view, creating personal and compassionate character studies that expanded the emotional range of the typical pop ballad. Aznavour also acted in dozens of films, most famously Truffaut’s Shoot the Piano Player. He continued to perform and record music until just before his death in 2018. Charles Aznavour (/æznəˈvʊər/, French: ʃaʁl aznavuʁ), born Shahnour Vaghinag Aznavourian (Armenian: Շահնուր Վաղինակ Ազնավուրյան), was born on 22 May 1924, in Paris, to Armenian immigrants Michael Aznavourian and Knar Baghdasarian. He was nicknamed “Charles” by his French nurse, and the name stuck. Both of his parents had been professional stage performers in their native Armenia before ethnic violence forced them to flee to France. The hard-working couple ran a restaurant to earn their livelihood but the love for the performance arts never left them. His parents ensured that Charles received music and dance lessons as a child and introduced him to the stage at a young age. The boy loved performing and quit school to pursue a career as a performer. Aznavour started singing and performing in the nightclubs as a teenager. Around this time he met Pierre Roche with whom he collaborated and performed together. The duo also began writing songs and composing music and found some success in the late 1940s. Charles Aznavour was married three times: to Megan Rugel (1946), Evelyn Plessis (1956) and his widow Ulla Thorsell (1967). Five children were produced by these marriages: Séda, Patrick, Katia, Mischa, and Nicolas. A sixth child, Charles Jr., supposedly born in 1952, was invented by Yves Salgues who was Aznavour’s first official biographer but also a heroin addict. Aznavour often joked about his physique, the most talked-about aspect of which was his height; he stood 160 cm (5 ft 3 in) tall. He made this a source of self-deprecating humor over the years. Charles Aznavour channeled some of his energy into theater, making both his stage and screen debuts at age nine, in 1933, in the theater piece Un Bon Petite Diable and in the film La Guerre des Gosses. As an adolescent, he danced in nightclubs and sold newspapers, as well as touring with theatrical companies, and he wrote a nightclub act in partnership with Pierre Roche — Aznavour wrote the lyrics to their songs and it was through that material that he began his singing career. Early on, he learned to overcome his fears about his vocal limitations, in part with help from singing legend Edith Piaf, for whom he worked as a chauffeur, among other capacities; with her help, he developed a style that suited his capabilities and played to his strengths and also continued writing songs in earnest, some of which were performed by Piaf. In 1944, Aznavour and actor Pierre Roche began a partnership and in collaborative efforts performed in numerous nightclubs. It was through this partnership that Aznavour began to write songs and sing. The partnership’s first successes were in Canada in 1948-1950. Meanwhile, Aznavour wrote his first song entitled J’ai Bu in 1950. 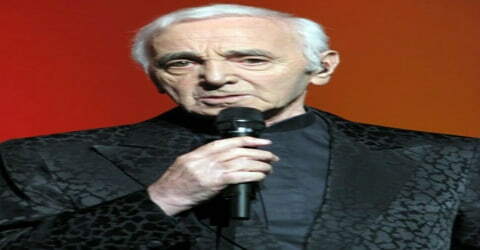 During the early stages of his career, Aznavour opened for Edith Piaf at the Moulin Rouge. Piaf then advised him to pursue a career in singing. Piaf helped Aznavour develop a distinctive voice that stimulated the best of his abilities. Soon his tenacity and resilience paid off and he was able to develop a style of singing that uniquely identified him and set him apart from the other singers. The year 1956 proved to be a significant one for him as he finally found the success he yearned for with the song, ‘Sur Ma Vie’ and was instantly propelled into stardom. Aznavour started receiving several engagements and within a few months, he earned a reputation as a much popular singer. His success came very slowly, however. Aznavour at first found some difficulty being accepted as a composer in France or anywhere else. His compositions, although considered tame by any modern standard, were regarded as too risqué for French radio and were banned from the airwaves for a decade or more, from the late ’40s through the end of the 1950s; American publishers seemed equally reticent about them, as he discovered on a visit to New York in 1948. That trip did yield his first performing engagement in the city, however, at the Cafe Society Downtown in Greenwich Village. For the next decade, Aznavour made his living as a performer in second-tier clubs and middle- or bottom-of-the-bill berths on three continents. His mix of daringly original and frank love songs, coupled with a limited but very expressive singing style, left audiences somewhat bewildered at first. 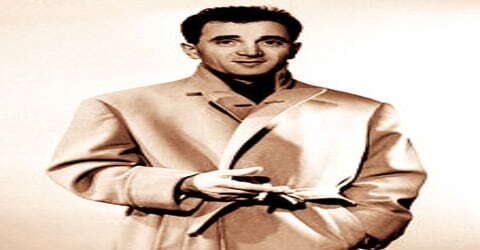 Over the 1960s Aznavour released several successful compositions including ‘Tu t’laisses aller’ (1960), ‘Il faut savoir’ (1961), ‘La mamma’ (1963), ‘Hier encore’ (1964), ‘Emmenez-moi’ (1967), and ‘et Désormais’ (1969). He sang at Carnegie Hall in the early ’60s and followed this up in 1965 with a one-man show, The World of Charles Aznavour, at the Ambassador Hotel in New York, which drew rave notices from audiences and critics alike. By that time, the once-struggling singer had secured his first American LP release with the similarly titled album The World of Charles Aznavour on Reprise Records, the label founded and run by Frank Sinatra. Aznavour’s voice was shaded towards the tenor range, but possessed the low range and coloration more typical of a baritone, contributing to his unique sound. Aznavour spoke and sang in many languages (French, English, Italian, Spanish, German, Russian, Armenian, Neapolitan and Kabyle), which helped him perform at Carnegie Hall, in the US, and other major venues around the world. He also recorded at least one song from the 18th-century Armenian poet Sayat-Nova, and a popular song, Im Yare in Armenian. “Que C’est Triste Venise”, sung in French, Italian (“Com’è Triste Venezia”), Spanish (“Venecia Sin Ti”), English (“How Sad Venice Can Be”) and German (“Venedig in Grau”), was very successful the mid-1960s. Along with his singing career, he also ventured into films and during the 1960s he appeared in several movies such ‘Un taxi pour Tobrouk’(1960), ‘Thomas l’imposteur’ (1964), ‘Paris au mois d’août’ (1966), and ‘Le Temps des loups’ (1969). In 1972 saw the release of his 23rd studio album, “Idiote je t’aime…”, which contained among others, two of his classics – Les plaisirs démodés (Old-Fashioned Pleasures) et Comme ils disent (As They Say), the latter dealing with homosexuality, which at the time, was revolutionary. 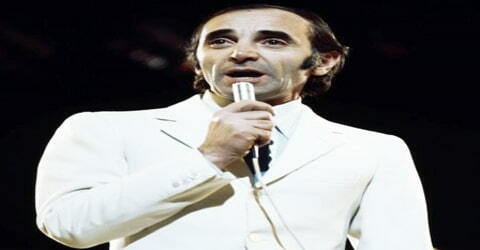 In 1974, Aznavour became a major success in the United Kingdom when his song “She” was number 1 on the UK Singles Chart for four weeks during a fourteen-week run. His other well-known song in the UK was the 1973 “The Old Fashioned Way”, which was on UK charts for 15 weeks. Charles Aznavour had risen to superstardom by the 1980s. By now he had achieved cult status and the fact that he could sing in several languages including French, English, Italian, Spanish, German, and Russian ensured that he achieved international fame. He along with Gerard Davoust acquired the music publishing company Editions Raoul Breton, in 1995. Aznavour has since worked with many talented French composers and songwriters including Lynda Lemay, Sensseverino, Alexis HK, Yves Never, Gerard Berliner, and Agnes Bihl. Aznavour would be the last to compare himself with those whom he regarded as truly gifted vocalists, such as Sinatra and Mel Tormé, preferring to think of himself as a composer who also happened to sing. His style of performing was compared variously to Maurice Chevalier and Sinatra and remained enduringly popular for decades. Almost all of Aznavour’s songs dealt with love and its permutations, running the gamut from upbeat, joyous pieces such as “Apres l’Amour” and “J’Ai Perdu la Tete” to the dark-hued “J’en Deduis Que Je t’Aime” and “Bon Anniversaire.” A teetotaler and a racing car enthusiast, Aznavour was married three times and had six children. At the start of autumn 2006, Aznavour initiated his farewell tour, performing in the US and Canada, and earning very positive reviews. Aznavour started 2007 with concerts all over Japan and Asia. In 2006, Aznavour recorded his album Colore ma vie in Cuba, with Chucho Valdés. 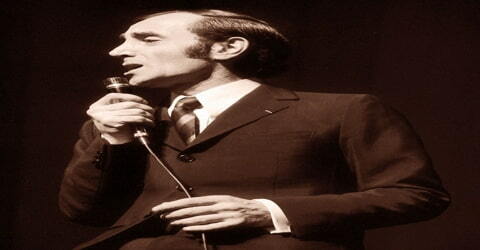 A regular guest vocalist on Star Academy, Aznavour sang alongside contestant Cyril Cinélu that same year. In 2007, he sang part of “Une vie d’amour” in Russian during a Moscow concert. Later, in July 2007, Aznavour was invited to perform at the Vieilles Charrues Festival. Forever Cool (2007), an album from Capitol/EMI, features Aznavour singing a new duet of “Everybody Loves Somebody Sometime” with the voice of Dean Martin. Aznavour finished a tour of Portugal in February 2008. Throughout the spring of 2008, Aznavour toured South America, holding a multitude of concerts in Argentina, Brazil, Chile, and Uruguay. In spite of his advancing age, Aznavour maintains a youthful demeanor and is optimistic about the future. He is still active in the music scenario and remains one of France’s most enduring performers. He was voted Time magazine’s entertainer of the 20th century because of his tremendous popularity and illustrious career. On 25 October 2013, Charles Aznavour performed in London for the first time in 25 years at the Royal Albert Hall; demand was so high that a second concert at the Royal Albert Hall was scheduled for June 2014. In November 2013, Aznavour appeared with Achinoam Nini (Noa) in a concert, dedicated to peace, at the Nokia Arena in Tel Aviv. The audience, including Israeli president Shimon Peres (Peres and Aznavour had a meeting prior to the performance), sang along. In December 2013 Aznavour gave two concerts in the Netherlands at the Heineken Music Hall in Amsterdam, and again in January 2016 (originally scheduled for November 2015 but postponed due to a brief stomach flu). In 2017 and 2018, his tour continued in São Paulo, Rio de Janeiro, Santiago, Buenos Aires, Moscow, Vienna, Perth, Sydney, Melbourne and Haiti, Tokyo, Osaka, Madrid, Milan, Rome, St. Petersburg, Paris, London, Amsterdam, and Monaco. On 19 September 2018, what was to be his last concert took place in NHK Hall, Osaka. Charles Aznavour won the Golden Lion Honorary Award at the Venice Film Festival for the Italian version of the song ‘Mourir d’aimer’ in 1971. 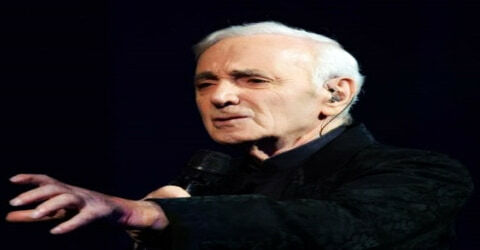 In 1995, Aznavour was named the Ambassador of Goodwill and Permanent Delegate of Armenia to UNESCO. He was inducted into the Songwriters Hall of Fame in 1996. Charles Aznavour was appointed as “Officier” (Officer) of the Légion d’honneur in 1997. The Marché International du Disque et de l’Edition Musicale (MIDEM) honored him with its Lifetime Achievement Award in 2009. On 1 October 2018, Charles Aznavour was found dead in a bathtub at his home at Mouriès at the age of 94. At the time of his death, his tax residence was in Saint-Sulpice, Vaud, Switzerland. An autopsy report concluded that Aznavour died of cardiorespiratory arrest complicated by acute pulmonary edema. A requiem was held on October 6 by Catholicos Karekin II at the Armenian Cathedral of St. John the Baptist in Paris. He is buried in the family crypt in Montfort-l’Amaury cemetery. It was the single ‘She’, released in 1974 that established him as a major success in the United Kingdom; the song peaked at No. 1 on the UK Singles Chart and stayed there for four weeks. The song was also recorded in French, German and Italian and played a major role in making him an internationally famous singer.